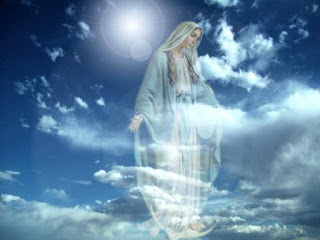 In 1950, the Pope declared that the Assumption of our Lady should be treated as a dogma of the Church. What is the significance of the date? What happened prior to 1950? … Yes, World War II had just ended lest than 10 years ago. Nevertheless, the whole of Europe and many parts of Asia and North Africa were still in ruins. It was only after the war that the people came to realise the extent of atrocities committed. Millions of people were dead, either victims of fighting or the result of the concentration camps. More were dying due to the lack of amenities, nutrition and shelter. Although the Germans in Europe and the Japanese in Asia were defeated, there was a general feeling of hopelessness. The questions many people asked were these: Where was God when all of this happened? Is there more to this human life of suffering? Is human life precious and valuable? What must we do in the face of overwhelming evil? The Church’s answer to these questions came in the form of the dogma of the Assumption. The dogma and the Feast of the Assumption was, above all, a message of hope. It is hope especially for those who seem hopeless. It is hope for those who are weak. It is hope for those who seem overwhelmed by the power of evil. It is hope for those who are close to defeat and failure. It is hope for those who have suffered much. In today’s first reading, we see the vision of the writer of the book of Apocalypse. It is a vision of a confrontation between to unequal parties. We have the woman – a symbol of powerlessness and weakness. Her vulnerable position is made worse by the fact that she is in labour. On the other side, we have the picture of the fearsome of dragon. The dragon towers over the woman. It appears that nothing can withstand the power of the dragon. But God intervenes. God saves the woman and allows her to bring a child into this world- a simple child who will be the real ruler of the universe and not the dragon. At the moment when all appeared to be lost, at the moment of certain defeat, God ensures victory for those who are weak and afflicted. Today we may be in the midst of a difficult situation, we may be facing a problem that seems so huge. Today, we may be ready to give up in the face of failure. Today, we may feel that our voice cannot be heard because we are a minority living in the country controlled by others. Today, the darkness and evil of the world may seem so overwhelming that there appears to be no way out. Yet, today, on this Feast of the Assumption, we are reminded that the power of God is much greater than any of these things. Evil and death can crush the body, but it cannot crush the soul. Others may take away our external freedom – freedom to speak out, freedom to change our religion – but they cannot take away our inner freedom, the freedom of our conscience. Problems may threaten us from every angle, but problems cannot overcome us. Today, we echo the hope of Mary in affirming the greatness of God – this is the God, who according to St. Paul, will put all his enemies including death under his feet.